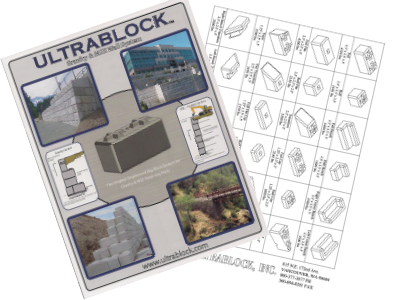 Ultrablock concrete blocks are engineered and designed to build segmental modular block retaining walls. In addition to retaining wall blocks, these units are also recommended and utilized for all types of slope protection, landslide repairs, crib-wall alternatives, gabions, rock/boulder walls and timber lagging. In addition to slope protection, there are a wide variety of uses for Ultrablock units including: containment bunkers, bulkheads, seawalls, wingwalls for bridges, barriers, retention ponds, culverts, wine storage facilities, etc.